ROOF BARS AND ROOF RACKS. Mag-Tower 3 Man Hard Shell Roof Tent Bars 145cm Wide Camping BMW X3 10-On. View Full Range of items for your vehicle. The outer hard shell is made from tough fibreglass and comes in a stylish white finish. The fabric is made from 600D polyester which is PU coated, waterproof and comes in coffee brown colour. Why don't we have it open with hydraulics or an electric motor? These are liable to fail and are costly to repair or replace, whereas the hand crank opening is tough, relaible and will last for years. This tent can be set us in less than 2 minutes! It comes with a thick 7cm mattress with a removable cover which is machine washable. 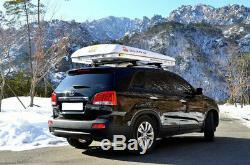 Mont Blanc Activa Aluminium roof bars (see specs at the bottom of the description). Stowaway net in ceiling for storage. 2 double hooks for hanging clothes or the light. 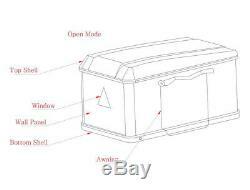 Specifications for Hard Shell Tent. 600D polyester with PU coated waterproof. Mattress size: Length 185cm, width 135cm. 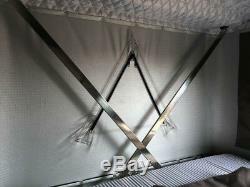 Aluminium ladder 2.1m long. Specifications for Mont Blanc Activa Aluminium Roof Bars. Fitting tool is supplied with product and is integrated within the roof bars for safekeeping and easy access. Fully assembled, 1 pack Aero aluminium roof bars for vehicles with open and integrated roof rails. Load capacity of up to 100kg (please check vehicle handbook for recommended max load). Provide stylish aerodynamic use with easy access T slot section. Quick and easy to install. Supplied with 4 locks and keys, locking the bars to vehicle rails. For integrated roof rails a separate fitting kit is required. 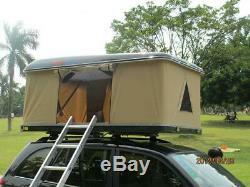 Please note your roof bars need to be a minimum of 120cm apart to be able to support the tent. Direct 4x4 Manufacturing Ltd has been established since 1997. We are direct importers and bring accessories in by the container load, passing these vast savings on to you. We have massive stocks in our warehouses, physically on the shelves. We offer 4x4 accessories including stainless steel wheel covers, running boards, rear corner bars, tonneau covers, roof racks, roof bars, rear ladders, trim etc. We now have regular deliveries to keep up with supply and our ever expanding list of products. From humble beginnings we have gone from strength to strength and are now one of the market leaders in this country. We still hold to the values that we had in the beginning. Add to this a small, friendly staff and a customer driven ethos and the results will follow. Quality Direct 4x4 Manufacturing Ltd, source the best possible products, from the best suppliers. Product lines include side bars, running boards, roof racks, roof bars, spare tyre covers, rear ladders, rear skid bars, and tail light guards. Many of our suppliers are proud to be OEM (original equipment manufacturers) suppliers of KIA, HYUNDAI, HONDA, NISSAN, GMC, ISUZU, JMC, TOYOTA, VOLKSWAGEN EUROPE and JEEP. These products are tested to reach the exacting standards of the vehicle manufacturers, which means you receive all the benefits without the OEM price. A VAT receipt will be sent out with the goods. Please allow extra time if you are paying by cheque. 3472240 Unit 2, Masons Pl, Nottingham Derby. DE21 6AQ, to the customer named on the order form. All orders are classed as accepted once the order has been dispatched. Any correspondence before dispatch is simply an acknowledgement of receipt of the order. We accept cheques, postal orders and bank transfers. If you wish to send a cheque or postal order, please send to our postal address (above). Goods will only be sent out for cleared funds. We take great pride in our products and have thousands of satisfied customers. 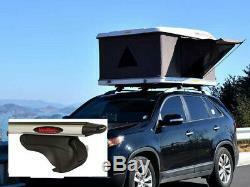 The item "Mag-Tower 3 Man Hard Shell Roof Tent Bars 145cm Wide Camping BMW X3 10-On" is in sale since Friday, January 5, 2018. 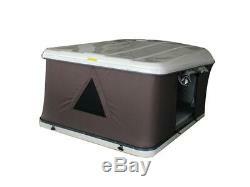 This item is in the category "Vehicle Parts & Accessories\Motorhome Parts & Accessories\Awnings". 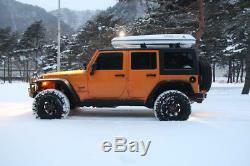 The seller is "direct4x4" and is located in Derby. This item can be shipped worldwide.